Come exploring with us for the best day sailing Bay of Islands has to offer! Step straight off the beach onto our catamaran and explore many idyllic spots in comfort and style! The Island Hopper Cruise has something for everyone! Looking for a fun way to relax at the end of day? 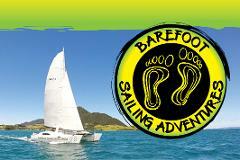 Join Barefoot Sailing Adventures for a Sundowner cruise. Departs from Paihia Beach at 5pm, this evening cruise takes in the sights of The Bay of Islands just as the day is coming to a close. Private Charter Day Cruises are ideal for groups of friends, wedding parties, family get-togethers or team building events. Create your own unique sailing adventure with us! Max 16 guests. Please enquire for over 16 guests. Book the boat exclusively for an evening of relaxation, socialising, celebrations, or romance. Book your own private sailing charter and discover the magic. Max 16 guests. Please enquire for over 16 guests. Looking for something a little different? A Sundowner Evening Cruise is a great way to spend an evening taking in the sights of the Bay of Islands. Enjoy a 2 hour relaxed evening sail around the inner bays, just as the day is closing. Looking for something a little different? Island Hopper Day Cruise is a perfect gift for someone wanting to share or give a unique experience. This will be one unforgettable gift!